This past Sunday, a dear, elderly man came to our outdoor service for the first time. He often frequents our Wednesday morning coffee & prayer fellowship. He is always gracious, always has a kind word, always a warm smile. The day was sunny and hot. 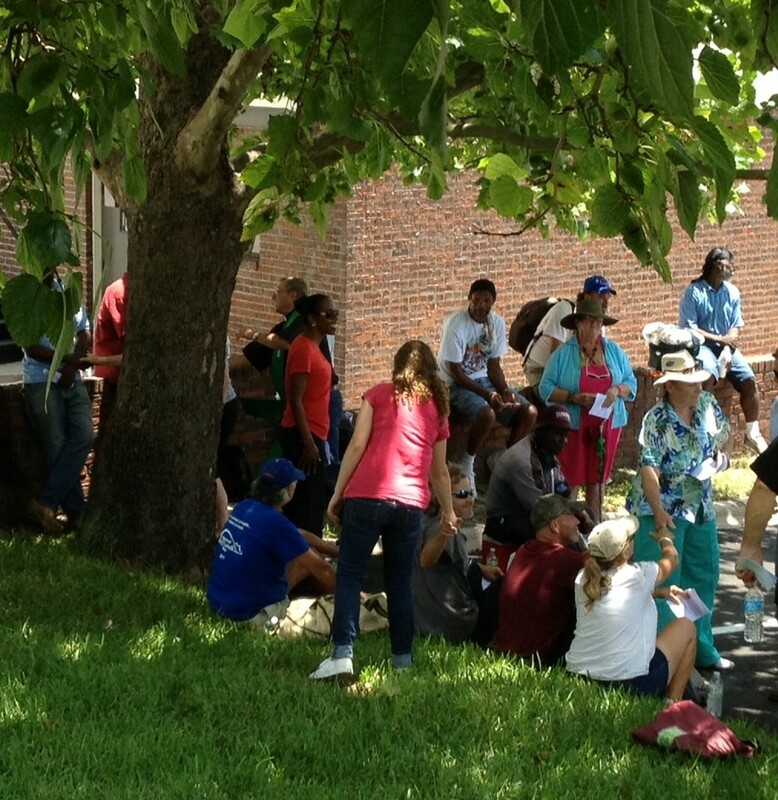 Folks began gathering in the shade of the sycamore 45 minutes before the service was to begin. Some time before the start of the service, this gentleman came walking across the parking lot, carrying a small folding chair. He was dressed in dark trousers and a deep tan shirt, ironed crisply and buttoned up. He wore a simple wooden cross. He greeted us warmly and accepted a cool bottle of water before planting his chair near the base of the tree. He looked regal as he sat tall in that simple chair — but it was a royalty grounded in utter humility. He was like a tree himself, deeply rooted, full of life in a quiet sort of way even as the love in him emanated like branches reaching out. He embodied dignity and reverence. At the time in the service when we have a holy conversation, I asked this beautiful community to begin thinking and praying about what God might be calling us to be, how we are to steward this gift of space and time for gathering and worship. I asked folks to think about how they might like to serve and what gifts they might like to share. One man admitted that he can sing; soon I hope he will want to share this with us. During the prayers of the people, one woman shared that she was visiting her daughter and granddaughters who are currently sheltered here. She expressed deep gratitude for how freely God’s love flows, how freely kindness flows, even in the streets. Her beautiful granddaughters beamed as they enjoyed fellowship with a lovely young college student who was visiting our community for the first time. At the end of our service, when I asked for a volunteer to bless our picnic lunch, a woman who has been with us for a few weeks tentatively came forward from the edge of our group. She stood squarely under the sycamore and gave thanks for our gathering, for friendship, for our lunch and for all the blessings God provides. This entry was posted in congregational development, Diocese of Florida, Episcopal church, Grace, Uncategorized, unity and tagged church plant, church without walls, community, grace, holy ground, homelessness, hope, mercy, option for the poor, radical hospitality, simple prayer, street ministry. Bookmark the permalink. 2 Responses to Under the sycamore. How simple!! How beautiful!! How blessed!! How simply, beautifully, blessed!!!! Beautifully, simply said, my friend. You are a blessing!